September Story Live; Submissions Now Closed; An Announcement! Michelle M. Welch is a fan of speculative fiction, music, history, and dessert. Her musical interest dates back to childhood and she briefly attended music school before deciding, like Andy, that she wasn’t the best musician. She is the author of the fantasy novel Confidence Game and her short fiction has appeared in Realms of Fantasy and M-BRANE SF. She lives in Arizona with two cats, one husband, and too many musical instruments. 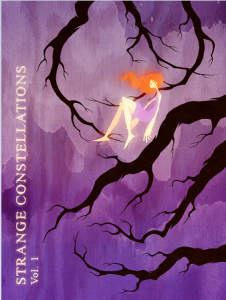 Finally, as you may have noticed at the top of this post, the cover for Volume One of Strange Constellations is now complete. It’s a scene from the very first Strange Constellations story, “The God In Her Veins.” We’re working on finishing up the anthology, but it should be free very soon. The illustration was created by the excellent Joseph Irizarry, who managed to perfectly capture the feel we were hoping for. As you can imagine, we’re pretty excited about getting the finished product out into the world.